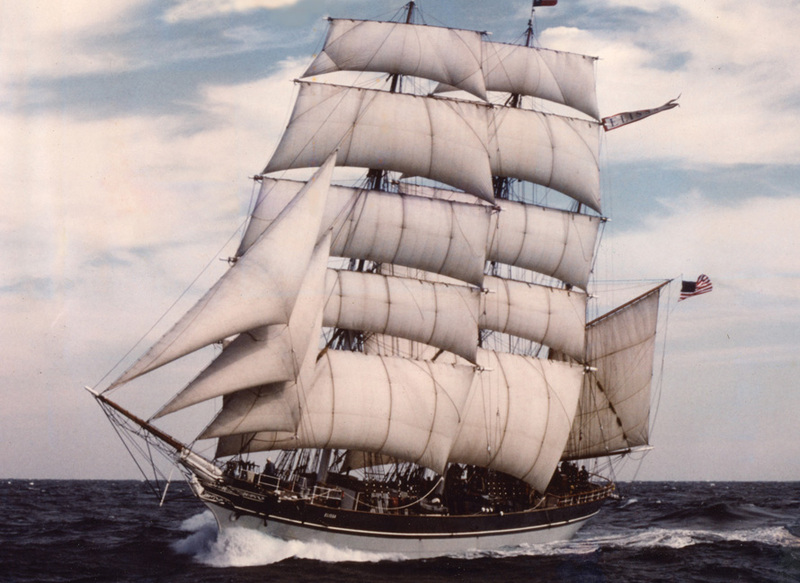 2019 sees the Official Tall Ship of Texas, return to the waters of the Gulf of Mexico for her annual daysail series. As one of the oldest, and longest continuously sailed vessels in the world, the annual daysails keep her where she works best, with her sails down, sailing in the Gulf waters. New this year, Galveston Historical Foundation is able to offer a limited number of spots onboard as a sail training student. As a sail training student, participants will experience what life was like as a 19th-century sailor. The program includes both hands-on and lecture learning, focusing on setting sails and maneuvering the 141-year-old ship through the Gulf of Mexico. Come with us on this journey through the past and experience your own piece of history. Held on Saturday, April 6, the annual fundraising event will feature hors-d’oeuvres, craft beer and wine, incredible auction items and more! 100% of the proceeds benefit ELISSA and the many educational and training programs of the Texas Seaport Museum. The Plankowners’ Sailabration also offers the public the opportunity to join the Plankowners’ II Syndicate. By joining ELISSA’s Plankowners’ II Syndicate with the purchase of a plank, you can earn your place in the history of the ship. Each plank donation will be honored with the purchaser’s name recorded and displayed on ELISSA’s Plankowners’ II Honor Board for posterity. 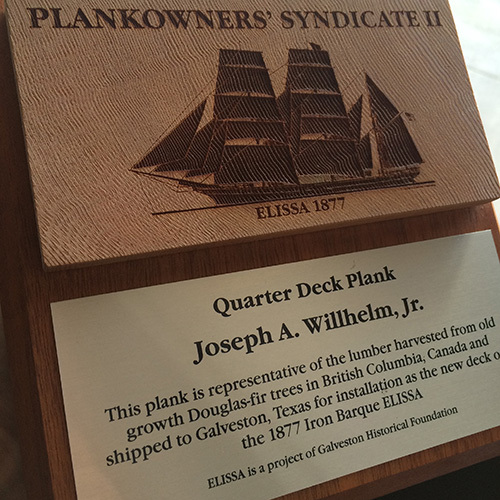 Texas Seaport Museum founded the ELISSA Plankowners’ Syndicate in 1980 to honor a special group of donors. Through in-kind and cash contributions, individuals and businesses purchased planks for ELISSA’s decks. In 1985, Plankowners’ Syndicate members were invited to the first Plankowners’ Syndicate Party. The sale of the final plank inspired a new opportunity for the sale of 318 iron hull plates and in 1990, Hullplate Owners joined the Syndicate and the tradition was opened to GHF members and guests. The annual event is now open to the general public. The ELISSA Plankowners’ Syndicate was founded in 1980 to honor a special group of ELISSA donors. Through in-kind and cash contributions, individuals and businesses “purchased planks” from ELISSA’s decks. These 540 pieces of Douglas Fir were carefully installed during the restoration. Membership in the Plankowners’ Syndicate was later institutionalized to provide ongoing financial support for Texas’ tall ship. Numbered planks were “sold” for increasing prices as availability decreased. Finally, the last plank was auctioned in June of 1990. A new opportunity to support ELISSA and the Texas Seaport Museum was inaugurated in September of 1990 when the sale of ELISSA’s 318 iron hull plates was added to the Syndicate offerings. The Syndicate includes individuals, businesses, and memorial gifts. Planks and hull plates have been purchased to honor new babies, as wedding and birthday gifts, and as rememberances of loved ones. A hullplate sales table will be open throughout the evening. In 1985, Plankowners were invited to the first Plankowners’ Syndicate Auction, an opportunity to purchase nautical items which had been donated for the support of ELISSA. The affair proved to be a big success, and thus began the annual party and auction. In 1990 the tradition was opened to GHF members and guests. The party is now held at the Texas Seaport Museum and includes entertainment, food, drinks, and silent and live auctions. Funds generated from this event go for the support of the many educational programs of Texas Seaport Museum and ongoing maintenance of ELISSA. By joining ELISSA’s Plankowners’ II Syndicate with the purchase of a plank, you can earn your place in the history of the ship. Your plank donation will be honored with your desired inscription and displayed on ELISSA’s Plankowners’ II Honor Board for posterity. What a legacy for you and future generations of your family! An essential stage of ELISSA’s 2012-13 restoration was the renewal of her timber deck planks, which after over 30 years under the hot Texas sun required complete replacement. Unlike the 1980 restoration, quality Douglas fir timber is costly. Each plank for the current restoration project has an estimated, average cost of over $900. Over 468 new deck planks were worked and fastened into place during the Fall of 2013. This was the last major milestone in returning ELISSA to sea and to have her grace the waters of the Gulf of Mexico under sail again. Recognition on a plaque displayed in the Texas Seaport Museum. A section of new planking engraved with the image of ELISSA and plank number.